I know it seems I add avocado to everything. It's not entirely true, but I won't deny I don't love nature's creamy green butter and test recipes using them all the time. 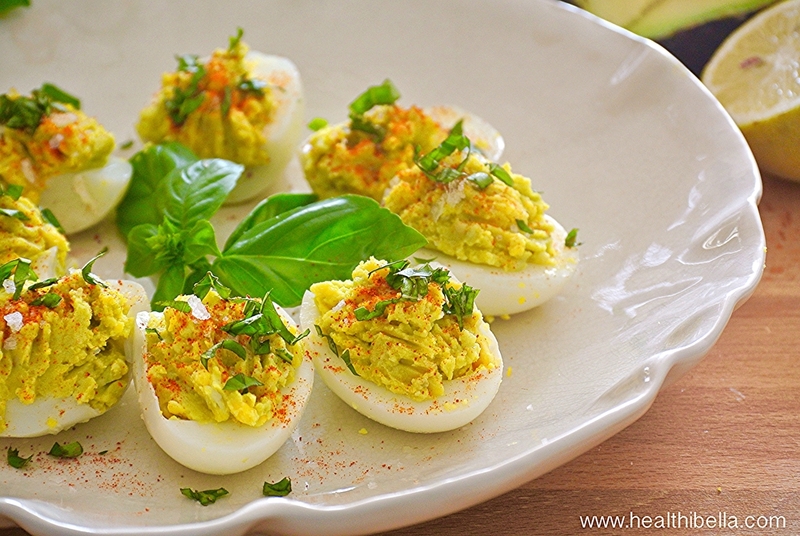 I do, however, love to add them to the yolks to make deviled eggs. I first tried this a couple of years ago to sneak in avocado in my kids food (although I do tell them it's in there), and it just seemed so perfect. It even means you can ditch the mayonnaise altogether. Just season with a bit of lemon (you also need the lemon's antioxidants to keep the avocado color fresh), little fleur de sel (I used Mallorcan, but Maldons is maybe more widely available), Spanish pimentón (or paprika), and your herb of choice, such as basil, parsley, or cilantro...and voilà, we have an updated, healthier spin on the traditional deviled egg! Enjoy! Halve the eggs. Carefully remove the yolks and put them in a bowl. Add the amount of avocado to the yolks. I use about 1 tablespoon per egg. Mix and mash the yolks, avocado, and lemon juice until well combined. Season with fleur de sel. Scoop a little bit of the deviled mixture into each egg half. Dust with pimentón and a bit more fleur de sel.